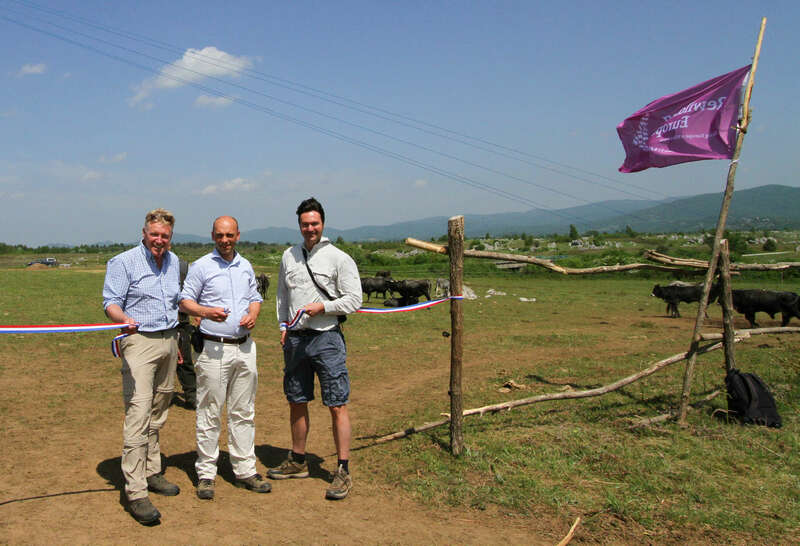 On Tuesday 19th May, the release of a herd counting 23 Bosnian mountain horses marked the start of an exciting natural grazing pilot in 500 hectares of the spectacular Lika Plains in the Velebit rewilding area. 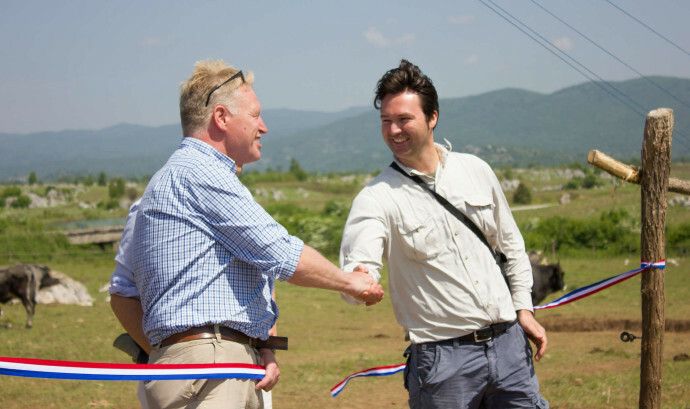 Guests from Adessium Foundation, Rogier van der Weerd and Floris van Hest together with Frans Schepers, Managing Director of Rewilding Europe, jointly cut the Croatian coloured ribbon, symbolising the opening of the site and releasing the animals. The herd of semi-wild horses was released into the new large grazing area of 500 hectares near Zirr in Lika Plains, and was joined by a new 7 year old stallion brought from Ergela Planido, Slovenia, to strengthen the herd and put a mark on this milestone event. 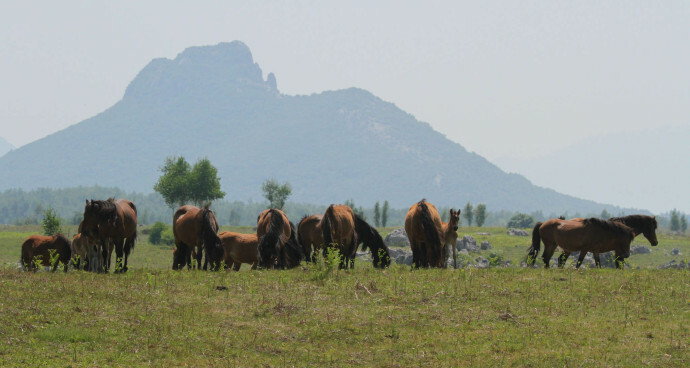 The herd was previously part of the group grazing in Malo Libinje in the southern part of the Velebit range. All animals were transported to Lika plains in April to become part of this natural grazing pilot. 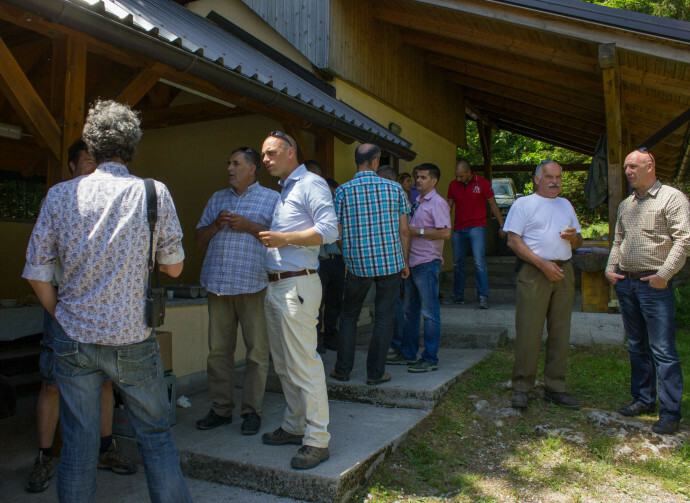 Adessium Foundation and WWF Netherlands, two major financial partners of Rewilding Europe, participated in the celebration together with the main Croatian stakeholders, partners, local authorities, landowners and members of the local community. 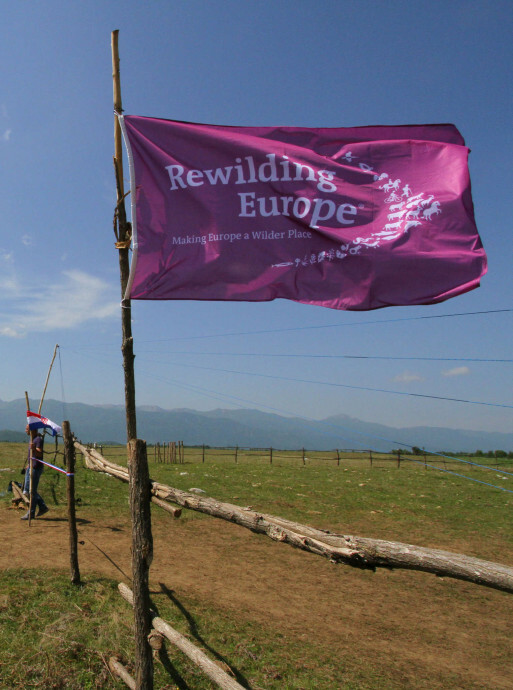 “This is a very important milestone for Velebit,” says Davor Krmpotic, leader of the Rewilding Velebit initiative in Croatia. 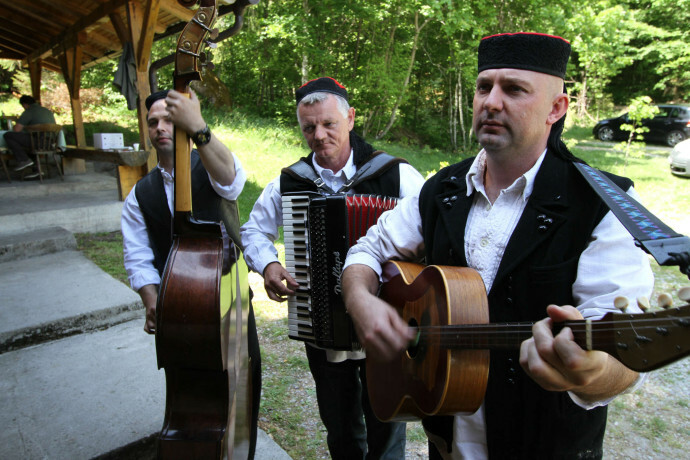 “Witnessing our efforts becoming reality and noticing the vast support given to us from the local community and our partners in Lika is exceptional. 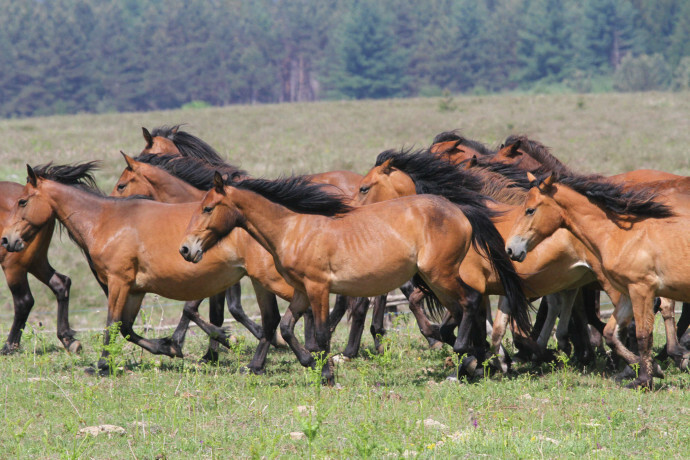 The image of horses running wild and free on Lika Plains was one I will never forget,” Davor continues. Natural grazing is all about the return of wild and semi-wild grazers to their natural habitats where animals are sustained with less human intervention, in natural densities, and towards becoming self-sufficient. The herd of Bosnian mountain horses in Lika plains is now grazing jointly with a herd of Boskarin cattle that is a part of the Tauros Programme. This will result in creation of social herds that can fend off predators themselves and find their own resources year-round. Given the lack of grazing animals in Lika plains, the loss of biodiversity of the grasslands was evident and recorded. Only six months after the arrival of the first animals, the change in grasslands of the fenced area is visible and the same effect will soon unravel in the larger grazing pilot area, soon covering 1 000 hectares. 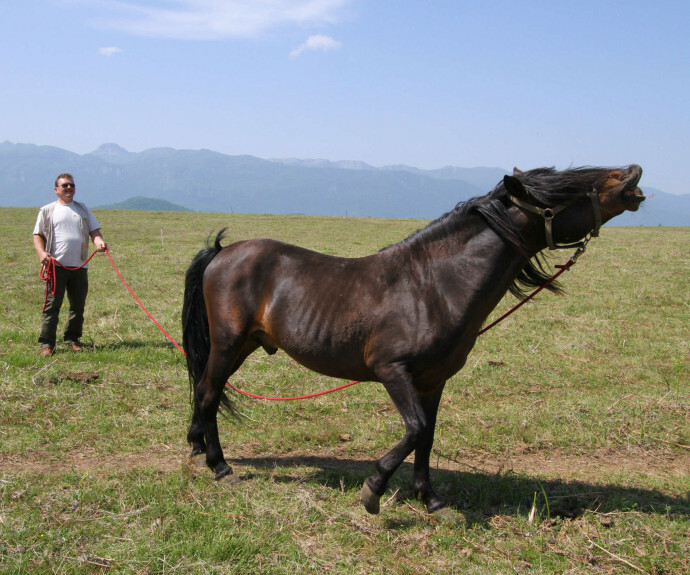 The Bosnian mountain horse is one of the horse breeds that has been selected as suitable for rewilding, according to the report ‘Rewilding horses in Europe’, published by Rewilding Europe in 2014. The vast area of beautiful open Lika Plains provide a unique opportunity for rewilding activities on more then 30 000 hectares of land. 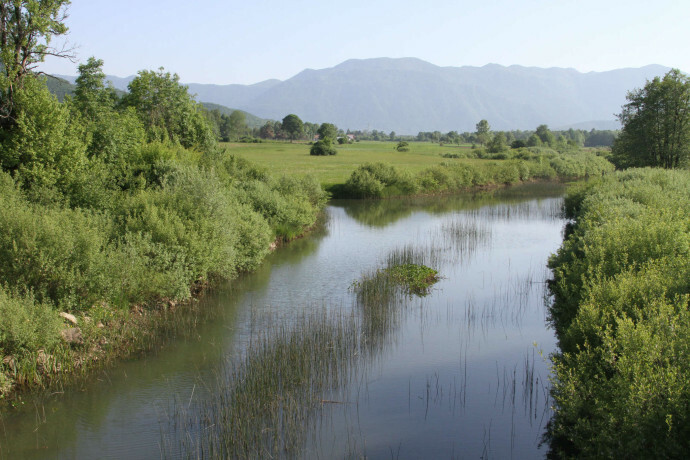 Located on the northeast side of Velebit Mountain chain, Lika Plains have a permanent water source (Lika River) and offer a future possibility of seasonal and altitudinal grazing, enabling wildlife movements from the plains in the summer to the mountain slopes in winter. 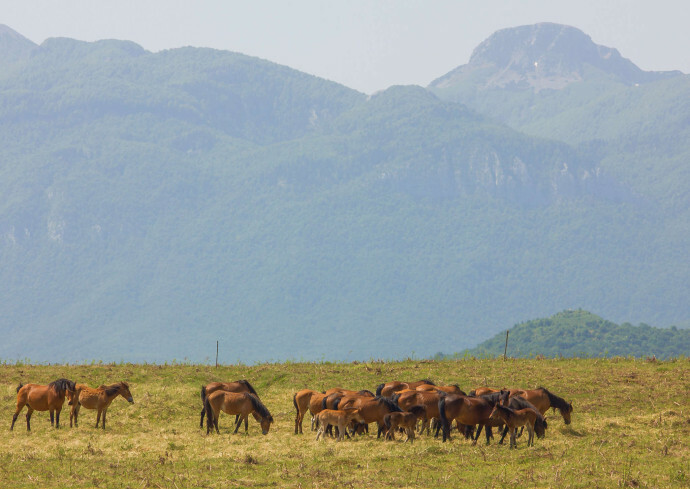 Lika Plains could become a unique area in combination with Velebit Nature Park, where nature takes care of itself and natural grazing with horses and large herbivores maintain unique grassland habitats and mosaic landscapes, all part of Natura 2000 sites. A portion of this vast grazing site is visible from the highway connecting Zagreb with the coast. The presence of large herbivores and wild animals will attracts nature lovers, wildlife watchers and other tourists, resulting in a nice synergy of ecological, business and tourism benefits. Wild horses in Croatian Lika Plains.